(Nanowerk News) Hard-wiring beetles for radio-controlled flight turns out to be a fitting way to learn more about their biology. Cyborg insect research led by engineers at the University of California, Berkeley, and Singapore's Nanyang Technological University (NTU) is enabling new revelations about a muscle used by beetles for finely graded turns. By strapping tiny computers and wireless radios onto the backs of giant flower beetles and recording neuromuscular data as the bugs flew untethered, scientists determined that a muscle known for controlling the folding of wings was also critical to steering. The researchers then used that information to improve the precision of the beetles' remote-controlled turns. This study, to be published Monday, March 16, in the journal Current Biology, showcases the potential of wireless sensors in biological research. Research in this field could also lead to applications such as tools to aid search-and-rescue operations in areas too dangerous for humans. "This is a demonstration of how tiny electronics can answer interesting, fundamental questions for the larger scientific community," said Michel Maharbiz, an associate professor in UC Berkeley's Department of Electrical Engineering and Computer Sciences and the study's principal investigator. "Biologists trying to record and study flying insects typically had to do so with the subject tethered. It had been unclear if tethering interfered with the insect's natural flight motions." In particular, the researchers said, it had been difficult to elucidate the role that smaller muscles play in fine steering. What the new study found was that the coleopteran third axillary sclerite (3Ax) muscle, found in the articulation of insect wings, plays a key function in the beetle's ability to steer left or right. "Since the 1800s, this coleopteran muscle was thought to function solely in wing folding," said study lead author Hirotaka Sato, an assistant professor at NTU's School of Mechanical and Aerospace Engineering. "Our wireless system allows us to record neuromuscular movements in natural, free flight, so we see now that this muscle is also used for turning." The researchers tested the function of this muscle by stimulating it during flight for graded turns that were more controlled than previous versions of the cyborg beetle. Experiments were done with Mecynorrhina torquata, or giant flower beetles. They averaged 6 centimeters in length and 8 grams in weight, about as heavy as a $1 coin. The beetle backpack is made up of a tiny, off-the-shelf microcontroller and a built-in wireless receiver and transmitter. Six electrodes are connected to the beetle's optic lobes and flight muscles. The entire device is powered by a 3.9-volt micro lithium battery and weighs 1 to 1.5 grams. 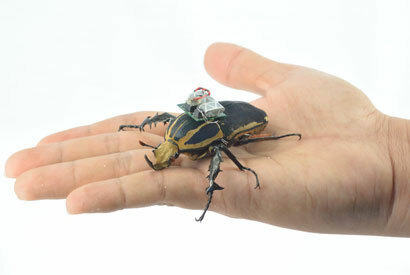 "Beetles are ideal study subjects because they can carry relatively heavy payloads," said Sato, who began the work while he was a postdoctoral researcher at UC Berkeley and has continued the project at NTU. "We could easily add a small microphone and thermal sensors for applications in search-and-rescue missions. With this technology, we could safely explore areas not accessible before, such as the small nooks and crevices in a collapsed building." During test flights, signals were transmitted to the beetle backpack every millisecond, directing the beetles to take off, turn left or right, or even hover in mid-flight. The beetles were untethered but in a closed room equipped with eight 3-D motion-capture cameras. "In our earlier work using beetles in remote-controlled flight, we showed excellent control of flight initiation and cessation, but relatively crude control of steering during free flight," said Maharbiz. "Our findings about the flight muscle allowed us to demonstrate for the first time a higher level of control of free-flying beetles. It's a great partnership between engineering and science."